"Bless me, Father, for I have sinned. My last yarn confession was about eleven minutes ago. I've broken my vows, Father. I fell off the wagon. 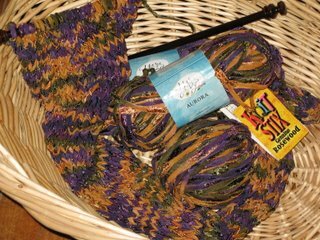 I bought more yarn. But I couldn't help it, it was just lying there seductively when I went into Hobby Lobby to buy some paintbrushes." "No, Father, it wasn't blocking the entrance." "Yes, Father, I know. I should have avoided the Near Occasion of Sin by not going into Hobby Lobby in the first place, even though all I wanted to do was buy a few inexpensive art brushes, for detail work, for painting my Mom's house. And I especially should not have gone over there near the yarn aisles, much less walked down them. But I am human. The spirit is weak and the flesh is even weaker and this yarn was just lying there, just flaunting itself at me, wagging its bum in my face. And it was in New Orleans colors, which I have a weakness for these days, and it was soft. So soft. And it was this new yarn, good yarn, yummy yarn. Exotic. Alluring. Romantic, even. Not the sort of stuff you usually see in Hobby Lobby." "I know I am not supposed to covet my neighbors' goods, but Hobby Lobby is not exactly my neighbor, technically... I mean, there is a four-lane highway, a PIzza Hut, a McDonald's, an Exxon station, railroad tracks, a wide creek, two strip malls, a Mexican restaurant, a Blockbuster, a Goodwill store and a bank between our house and Hobby Lobby. And also, whether or not they technically count as a neighbor, I think the whole idea of retail is that you are supposed to covet their goods, and covet them mightily." "So there was this yarn, and I was seduced, but look at it. You'd be tempted too...."
"I'm sorry, Father... I'll put the yarn away... And then there were these rosewood needles. So pretty .... I couldn't help that either. I am so ashamed to have so little control over myself." "Oh, and a few more things ... I have used the Lord's name in vain a couple of times, but only when I was ripping back mohair lace ... and I was watching "Deadliest Catch" on TV last night, and I caught myself having impure thoughts regarding Captain Sig ... and there's been a bit of gluttony ... I got into the chocolate, and also the ice cream, but it was just one Klondike bar. Does that count?" Dez, if you're ripping mohair lace, *ten* Klondike bars don't count.. and if you're ripping the naviest of blue mohair lace, neither does the consumption of a half a jar of Scharffenberger chocolate sauce, as long as you remember to wipe your fingers! Greetings Dez... There really is a Zachary Zwerdling up here where we live now. I've never had the guts to ask him if his mother's name was Werdna! Glad to find you in the virtual world. Dez, from one Catholic to another evidently, I appreciate your humor :>. I've been trying (sigh) to stay on a yarn/needle budget until Stitches East, with moderate success. I'd been doing well until in my LYS and we we're discussing the Latte sweater in the latest Knitter's and I was complaining about how much Classic Elite Interlude costs and Lynn brought out several alternatives and so on and so on... The net result - I bought Berrocco's Suede, which surprisingly is looking great!! Oh my goodness... I ran across your blog and I LOVE that yarn! It's so perfectly Mardi Gras, that had better be the name of the colorway! All it's missing are Mardi Gras beads. 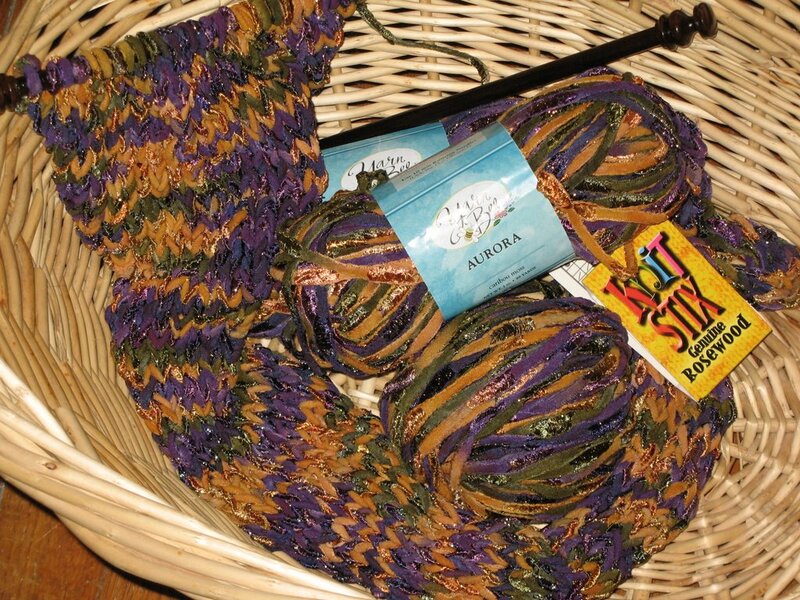 I have never seen this yarn at my Hobby Lobby, but I'm going to look out for it. What IS the colorway called, if you don't mind?